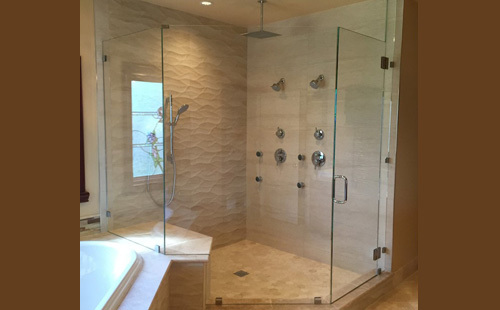 The Glass House specializes in the design and installation of custom shower enclosures. We are a professional glass shop that has served customers in Pasadena, Altadena, Arcadia, and other cities throughout the San Gabriel Valley for over 70 years and become known for our commitment to honesty, integrity, and excellence. We fabricate and install any style of framed or frameless shower and tub enclosure, including multiple panel systems, "doorless" and walk-in showers, fixed or hinged panels and doors, bypass sliders, barn door-style shower doors, and more. We complete every shower/tub enclosure installation to our customers' exact specifications, and take great pride in delivering exceptional workmanship at a reasonable price. All our jobs are supervised by one of our master glaziers, who each has over 40 years of experience. They insist on using top-rated brands, precision instruments, and the industry's best practices. At The Glass House, we don't compromise when it comes to quality. We use heavy glass for our shower doors and enclosures and top-of-the-line, durable hardware from C.R. Laurence. Glass choices range from clear or acid etched, sandblasted, obscure, or low iron glass (clear glass without the slight green tinge found in traditional "clear" glass). We take precise measurements of your shower or tub, then create the shower glass panels for your enclosure at our glass shop to ensure that we get the most accurate fit. Our shower and tub enclosures are installed with the tightest tolerances for a clean look that allows us to use silicone sealant instead of polycarbonate or plastic seals, which tend to crack and attract mold and mildew. We offer a diverse range of hinges and clamps. Give us call or visit us today to speak to a member of our staff who can help you plan your new shower/tub enclosure installation. We have a wide variety of contemporary and traditional glass door and enclosure options to elevate the look of any bathroom in the Pasadena, Alhambra, Altadena, Glendale, and Sierra Madre area. We're available Monday - Friday, 8am - 5pm. I come here to have glasses cut on various occasions. The owner, Martin, is quite knowlegable and friendly. The prices are always very reasonable and, as a bonus, my pieces are cut while I wait.